Olympus chairman Tsuyoshi Kikukawa is stepping down amid continuing management turmoil at the company. The Japanese camera and medical equipment maker has seen half of its market value wiped off the shares in the past week. It had fired its British chief executive, Michael Woodford, after he raised questions about extraordinarily high fees and the cost of takeovers. Olympus shares dropped 7.6% on Wednesday. "As we have troubled our customers, business partners and shareholders over a series of press reports and a slump in share prices, chairman and president Tsuyoshi Kikukawa today returned his titles, as well as his right to representation," the company said. Shuichi Takayama, a current director, will replace him as president. Mr Woodford alleged that he was dismissed for questioning Olympus' payment of $687m (£436m) as fees to financial advisers during the acquisition of UK medical equipment company Gyrus. 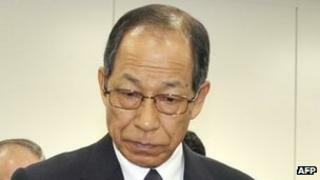 He was the first non-Japanese chief executive of Olympus, a role he took over six months ago. Mr Woodford commissioned auditors PricewaterhouseCoopers (PwC) to look into payments made by Olympus to a Cayman Island company. He told the BBC that he was ousted after he distributed a copy of the PwC report. What next for Olympus and its shareholders?